BABES WITH BULLETS — Sizzling hot book! We’ve got it. This special book is going places! Men have been longing for a way to tell their women that guns are fun, and get them more involved. “Babes With Bullets” is by a woman, and about women who started shooting later in life—for the fun of it! Debbie started at 45! Here are real woman who have taken up shooting sports because it’s fun. Author Debbie Ferns broke through the myths and taboos herself, and shares loads of stories of similar women—even attorney Sandy Froman, the past president of the NRA. It is nothing short of exhilarating. Anti-rights advocates now have a tough new adversary—women. “Babes With Bullets” changes the paradigm. 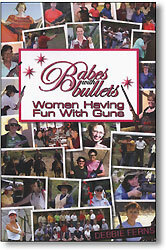 “Babes With Bullets” is a normative approach to guns—right up there with manicures and selecting your shoes. Gone is the coarse gun-rights stuff the men are often swimming in. But the right to go out and have all this fun, and to own firearms in the first place, and to protect your family in an emergency, is present throughout the book. A vigorous gun-savvy women’s network is growing, and it is powerful stuff. Businesses are responding to the buying power of the women. Politicians are hard pressed to ignore the women. Women like Susan Long are running shooting conferences for women, and women are winning Olympics competitions. The Texas “Divas” are now more than 800 strong. Women are helping to turn the tide on radical anti-rights gun bigotry our nation faces. The gun haters and hoplophobes don’t know what to make of real women with real guns. I loved “Babes With Bullets,” and we have it in stock ready to ship. Get one for yourself or someone you know.